BACKGROUND: A highly regulated trafficking of cargo vesicles in eukaryotes performs protein delivery to a variety of cellular compartments of endomembrane system. The two main routes, the secretory and the endocytic pathways have pivotal functions in uni- and multi-cellular organisms. Protein delivery and targeting includes cargo recognition, vesicle formation and fusion. Developing new tools to modulate protein trafficking allows better understanding the endomembrane system mechanisms and their regulation. The compound Sortin2 has been described as a protein trafficking modulator affecting targeting of the vacuolar protein carboxypeptidase Y (CPY), triggering its secretion in Saccharomyces cerevisiae. RESULTS: A reverse chemical-genetics approach was used to identify key proteins for Sortin2 bioactivity. A genome-wide Sortin2 resistance screen revealed six yeast deletion mutants that do not secrete CPY when grown at Sortin2 condition where the parental strain does: met18, sla1, clc1, dfg10, dpl1 and yjl175w. Integrating mutant phenotype and gene ontology annotation of the corresponding genes and their interactome pointed towards a high representation of genes involved in the endocytic process. In wild type yeast endocytosis towards the vacuole was faster in presence of Sortin2, which further validates the data of the genome-wide screen. This effect of Sortin2 depends on structural features of the molecule, suggesting compound specificity. Sortin2 did not affect endocytic trafficking in Sortin2-resistant mutants, strongly suggesting that the Sortin2 effects on the secretory and endocytic pathways are linked. CONCLUSIONS: Overall, the results reveal that Sortin2 enhances the endocytic transport pathway in Saccharomyces cerevisiae. This cellular effect is most likely at the level where secretory and endocytic pathways are merged. Them Sortin2 specificity over the endomembrane system places it as a powerful biological modulator for cell biology. Eukaryotes have developed an intricate system of protein delivery to various cellular compartments, based on highly regulated trafficking of cargo vesicles. Cargo recognition, vesicle formation and fusion represent the core of endomembrane system processes and form two main routes, the secretory and the endocytic pathways. These two pathways have pivotal functions in uni- and multi-cellular organisms. New discoveries have highlighted the role of the endomembrane system in diverse cellular processes such as cell polarity, signaling, development and response to environmental challenges [1, 2]. Therefore, new and innovative tools to manipulate endomem-brane trafficking are of great interest. Genetic approaches are usually carried out by genome-wide screens that involve searching through collections of mutants for those with altered sensitivities to the drug, i.e., hypersensitivity or resistance. The most used model to carry out such screenings has been Saccharomyces cer-evisiae deletion mutant collections, which have led to the identification of several novel components of cellular networks [7-9]. Drugs that impair vacuolar trafficking in S. cerevi-siae have been identified and called sorting inhibitors (Sortins) . These compounds mimic the phenotype of vacuolar protein sorting (vps) mutants [11-13] suggesting that they modify components of the endomembrane trafficking pathway. A genome-wide hypersensitivity screen showed that Sortin2 affects primarily components within the endomembrane system in yeast . This analysis identified 217 Sortin2 hypersensitive Saccharomyces deletion mutants in where the mutated genes are enrichment on genes products involved on protein trafficking and localized particularly in endosomes . Therefore the Sortin2 mode of action and the proteins involved on it are interesting subjects of study especially for further uses of the drug. In order to identify proteins that are critical for the mode of action of Sortin2, we used a reverse chemical-genetics approach; we performed a Sortin2-resistant genome-wide screening using a S. cerevisiae haploid deletion library. We found six ORFs whose deletion caused Sortin2 resistance. Mutant phenotypes, GO annotation and the interactome of the corresponding genes indicated endocytosis as the principal GO process. Consistently, Sortin2 treatment enhanced trafficking of the endocytic tracer FM4-64 toward the vacuole. Analysis of structure-bioactivity relationships suggested that Sor-tin2 effects on endocytosis toward the vacuole depend on Sortin2 structural features. Genetic and chemical analog analysis strongly suggests that the effect of Sortin2 on the secretory pathway is linked to its effect on endocytosis. In order to find important molecular component(s) for Sortin2 bioactivity in yeast, a screen for mutants resistant to Sortin2 was performed using a loss-of-function mutant collection of 4,800 haploid deletion S. cerevisiae strains. It was anticipated that this resistance screening would identify proteins required for Sortin2 bioactivity that were not codified by an essential gene. The parental strain secretes CPY when grown with 10 μΜ Sortin2 . The primary screen was performed with Sortin2 47 μΜ that is almost five times higher of the minimal concentration that trigger CPY secretion in the wild type strain. Therefore the screening could identify the strong resistance to Sortin2. Out of the entire collection, 36 putative resistant strains were identified (Additional file 1: Table S1). These strains were retested with different concentrations of Sortin2 to confirm the resistant phenotype. The threshold to consider a strain resistant to Sortin2 was 10 μΜ because that was the concentration that trigger secretion of CPY in the wild type strain using peroxidase detection. Mutant strains that did not secrete CPY with 10 μΜ Sortin2 were considered as Sortin2-resistant mutants. Out of the 36 primary screen hits, 6 mutants were confirmed as resistant to Sortin2 by this dosage dependence analysis (Figure 1; Additional file 1: Table S1). The results showed that slal, met18 and clc1 were resistant to up to 40 μΜ Sortin2. Furthermore dfg10 and dpl1 were resistant to Sortin2 up to 20 μΜ as well as the dubious mutant yjl175w. 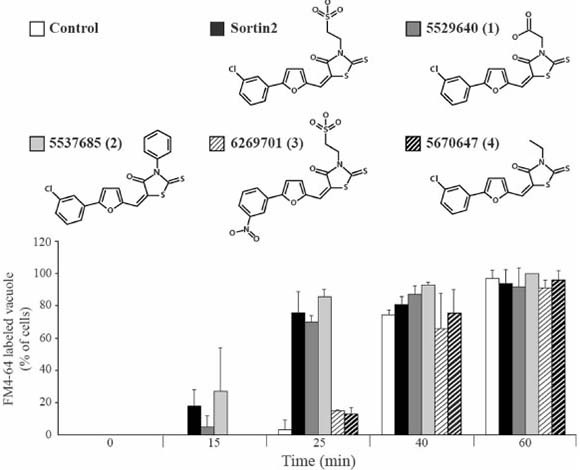 Sortin2 did not inhibit growth performance of the Sortin2-resistant mutants, which was evaluated by growing them in 47 μΜ of Sortin2 for 10 h (Additional file 2: Figure S1). Sortin2 does not inhibit the growth neither the viability of five of the Sortin2-resistant mutants when they grown for 72 h with 20 μΜ of the chemical (Additional file 3: Figure S2). Therefore, the observed resistance to Sortin2 of met18, sla1, clc1, dfg10 and dpl1 was not due to cell growth impairment but rather to changes in trafficking machinery that resulted in reduced secretion of CPY. In the case of yjl175w, which deletion affects a dubious gene, this condition of treatment inhibits its growth (Additional file 3: Figure S2). Therefore the lack of CPY secretion resistance to Sortin2 could be due to a lower amount of cells and CPY detection limits. Interestingly Sortin2 increases the viability of met18 and dpl1 suggesting than this compound improve cell performance (Additional file 3: Figure S2). Figure 1 Sortin2 S. cerevisiae resistance is specific to Sortin2-related structures. Mutant and parental (WT) strains were grown in YPD medium supplemented with the indicated concentrations of Sortin2 (μΜ), compound 5537685 and Sortinl. The control condition (0 μΜ Sortin2) contained 1% DMSO, which is present in all conditions since it is the solvent for the three compounds. The presence of CPY was analyzed on the growth medium by dot-blot using a CPY monoclonal antibody. The experiment was performed three times. CPY is a vacuolar soluble protein that is secreted to the extracellular medium under certain chemical or genetic conditions [10, 15, 16]. Therefore, the Sortin2 resistance observed in sla1, met18 and clc1 could be due to general defects in the secretory pathway in the mutant background. To test this hypothesis, Sortin1, which also induces secretion of CPY , was evaluated for its effect on CPY trafficking in identified resistant mutants. Sor-tin1 was able to trigger CPY secretion in the sla1, met18 and clc1 strains (Figure 1), suggesting that the mutants have a functional secretion pathway. Although Sortin1 triggers CPY secretion in sla1 in much less extension than the parental strain the sensitivity of sla1 to three different CPY-secretion triggering compounds confirms its ability to secrete CPY (Additional file 4: Figure S3). Importantly, Sortin1 treatment induced CPY-mistar-geting in Sortin2-resistant mutants, indicating that the corresponding deletion confers resistance to certain structural determinants of Sortin2. Furthermore, sla1, met18, clc1 and dfg10 were also resistant to the Sortin2 structural analog 5537685, revealing that Sortin2 resistance is specific for Sortin2-related structures in these strains (Figure 1). On the contrary, dpl1 and yjl175w were sensitive to 5537685 although their secretion was much weaker than the parental line. Therefore the Sortin2 resistance of these two mutants could be due to structural differences between Sortin2 and 5537685 (Figure 1). We further analyzed the gene ontology term representation for genes whose deletion provokes resistance to Sortin2. According to the GO annotation available in the S. cerevisiae database (SDG, http://www.yeastgenome. org/), four of those genes encode proteins that are related to endomembrane trafficking: CLC1, SLA1, DFG10 and DPL1 (Table 1). This finding is consistent with the specific mode of action of Sortin2 on the yeast endomembrane system . The CLC1 and SLA1 genes encode a clathrin light chain and an actin binding protein, respectively, and are directly involved in endocytosis [17, 24]. 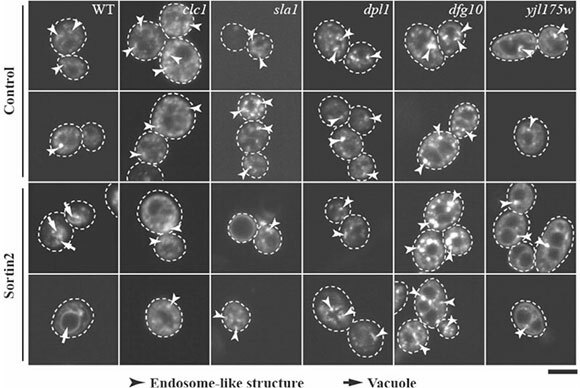 In addition, sla1, met18, dfg10 and yjl175w mutants show endocytosis defects, indicating that the encoding proteins are important for this cellular process . The YJL175W gene corresponds to a dubious ORF but its deletion also affects endocytosis . Therefore among the genes that encode proteins required for Sortin2 bioactivity, five out of six genes participate in the endocytosis process. Due to the functional characteristics of gene products affected in Sortin2-resistant mutants, the effect of Sor-tin2 in the endocytic route was analyzed. Internaliza-tion of the endocytic tracer FM4-64  was analyzed by confocal microscopy (Figure 2a). In wild type S. cerevisiae (control), the FM4-64 dye reached the vacuole in approximately 40 min (Figure 2b, c). However, in cells treated with Sortin2, FM4-64 reached the vac-uole in 25 min (Figure 2b, c), while in wild type cells the FM4-64 was still localized to endosome structures (Figure 2b). This result indicates that Sortin2 likely enhances endocytic trafficking towards the vacuole in S. cerevisiae. Figure 2 Sortin2 enhances internalization of FM4-64. a Diagram of FM4-64 endocytosis labeling. Cells were incubated with 24 μΜ FM4-64 for 30 min at 4°C for plasma membrane FM4-64 binding. Then turned to 28°C (time 0) to be imaged subsequently at different times of incubation by confocal microscopy. Progressively FM4-64 is progressively trafficking to intracellular compartments by endocytosis. b S. cerevisiae parental line was grown on YPD 1% DMSO (control) and YPD supplemented with 20 μM Sortin2. Two representative images of approximately 25 cells are shown in each condition. The experiment was performed three times. Scale bar represents 5 μm. c Cells with FM4-64 labeled vacuoles were scored in each condition on b. The percentage of cells with FM4-64 labeled vacuoles is informed with standard deviation. To determine the specificity of the Sortin2 impact on endocytosis, the effect of compounds structurally related to Sortin2 was analyzed. The results showed that chemicals 5529640 and 5537685 speed up the FM4-64 endo-cytic pathway similarly to Sortin2 (Figure 3, Additional file 5: Figure S4). Therefore changing the sulfonate group in Sortin2 did not have an impact in its effect on endo-cytosis. 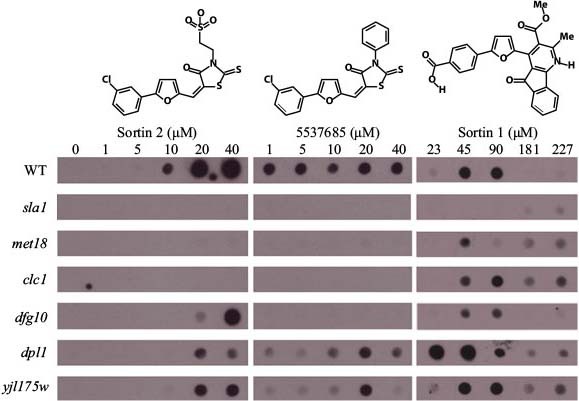 Importantly, both 5670647 and 6269701 compounds had no effect on endocytosis timing, indicating that functional groups on both ends of Sortin2 molecule are important for Sortin2 bioactivity (Figure 3, Additional file 5: Figure S4). This result is consistent with the lack of activity of 5670647 and very low potency of 6269701 regarding CPY secretion . Figure 3 Enhancing of endocytic trafficking depends on Sortin2 structural features. S. cerevisiae parental line was grown on YPD 1% DMSO (control) and YPD supplemented with 20 μM of different Sortin2-structural analogs. Afterwards cells were incubated with 24 μM FM4-64 for 30 min at 4°C. Then turned to 28°C to be imaged subsequently by confocal microscopy at different incubation times. Cells with FM4-64 labeled vacuoles were scored. The number of cells with labeled vacuoles relative to the total scored population (N = 30 cells) in different times of FM4-64 incubation is informed with standard deviation. 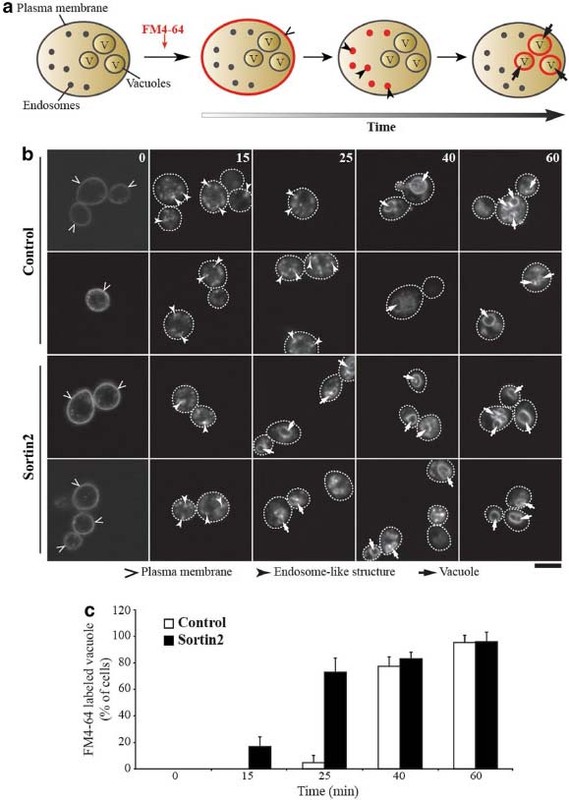 It has been demonstrated that Sortin2 not only impairs trafficking of CPY to the vacuole [10, 14] but also modifies the kinetics of endocytic trafficking in Saccharomyces cerevisiae. In order to test if the two phenotypes are linked, we analyzed whether Sortin2-resistant mutants were also resistant to the Sortin2 effect in endocytic trafficking toward the vacuole. Due to the size of the met18 mutant cells and subsequent difficulties in assessing their subcellular phenotypes, the met18 strain was not tested. Other Sortin2 resistant mutants were treated with Sor-tin2 at a concentration that made FM4-64 trafficking to the vacuole faster in the parental line (Figure 4). At 25 min FM4-64 labeled solely endosomes in all mutants treated with Sortin2, as in control conditions (Figure 4), indicating that mutations that confer Sortin2 resistance also suppressed the enhanced endocytosis phenotype observed for the wild-type strain. FM4-64 did not reach the vacuole at 25 min in any of the Sortin2-treated mutants. However, after 40 min of internalization FM4-64 was localized in the vacuole membrane, indicating that the lack of Sortin2 effect was not due to mutant impairment of endocytosis (Additional file 6: Figure S5). Figure 4 Sortin2 does not alter endocytic trafficking in Sortin2 resistant mutants. S. cerevisiae parental line (WT) and Sortin2 resistant mutants were grown on YPD supplemented with 1% DMSO (control) or 20 μΜ Sortin2. Cells were incubated with 24 μΜ FM4-64 for 30 min at 4°C. Then turned to 28°C to be imaged after 25 min by confocal microscopy. Images of 25 min incubation are shown. Two images are representative of 20 cells. The experiment was done more than three times. Scale bar represents 5 μm. In order to determine whether identified gene products required for Sortin2 bioactivity are directly or indirectly involved in endocytic pathways, their interactome network was determined using OSPREY software . 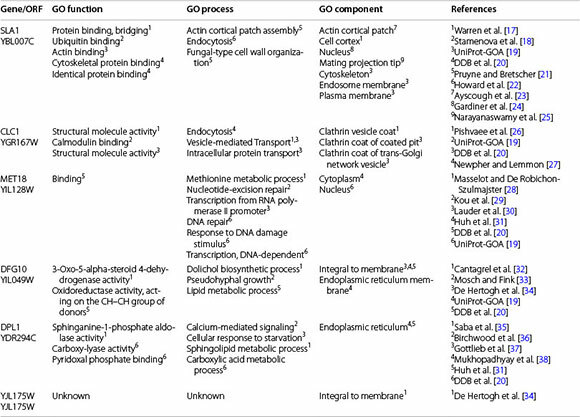 We used the six gene products as query to build the interac-tome of physical and genetic interactions. The resulting network contained 273 nodes with edges representing physical or genetic interactions (data not shown). These nodes were classified according to their location and cell function using CellLoc and FunCat tools (http://www.mips.gsf.de), respectively. The Sortin2 resistance interactome analysis showed genes involved in different cellular process. The largest enrichment processes were "Cell fate" and "Cell type differentiation" followed by "Cell cycle and DNA processing" and "Cellular communication/signal transduction mechanism" with 3.5, 3.3, 2.4 and 2.4 fold enrichment on the Sortin2-resist-ance interactome, respectively (Table 2). However, when more specific granular terms were analyzed, the results showed that the processes of "Regulation of DNA processing" and "Endocytosis" had the highest enrichment, with values of 11.1- and 8.3-fold, respectively (Additional file 7: Table S2). Moreover, the "Transcription elongation", "Actin cytoskeleton" and "G2/M transition of mitotic cell cycle" processes were also highly enriched (more than 5-fold, Additional file 7: Table S2). 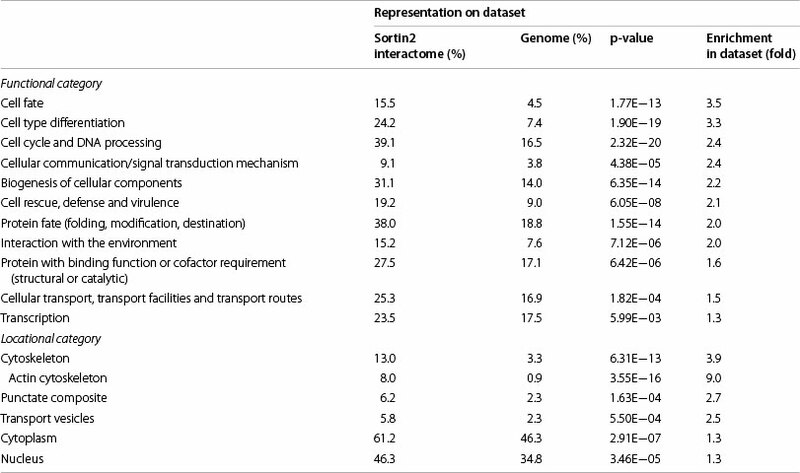 Regarding the cell location of the Sortin2 resistance interac-tome members, CellLoc categorization showed that the highest over-represented categories were "Cytoskeleton", "Transport vesicles" and "Punctate composite" (3.9-, 2.5-and 2.7-fold, respectively; Table 2). The enrichment of the "Cytoskeleton" category corresponded mainly to the "Actin cytoskeleton" category, which was enriched ninefold in the Sortin2-resistance interactome (Table 2). Sortin2-resistant mutants treated with Sortin2 did not show either CPY mistargeting or enhancing of the endo-cytic pathway that was observed in the wild type. This genetic evidence suggests that the Sortin2 effects of trafficking to the vacuole through the secretory system and endocytosis are linked. The Sortin2 structure-activity relationship analysis consistently supports this connection, since the Sortin2 effect on endocytosis depends on the same chemical features (see below) that have been shown for CPY trafficking . As the endocytic pathway converges on the same organelle, it is foreseeable that both observed phenotypes might be due to higher trafficking rate towards to vacuole at late endosome level. Sortin2-CPY secretion could be explained by lower abundance of CPY receptor at the TGN due to its higher anterograde trafficking rate. This is consistent with the faster traffic of FM4-64 endocytosis towards to vacuole due to Sortin2. We were unable to define precisely whether the alteration of both pathways shares the same molecular mode of action. Data from Sortin2-hypersen-sitive screen  together with the link between endocy-tosis and secretory pathway support that Sortin2 cellular target is located at late endosomal trafficking events. Since clc1, sla1and met18 resistance is observed at any tested chemical concentration the mode of action of Sortin2 could involve its binding to the missing gene product in the corresponding mutant. However the possibility that these proteins are involved in Sortin2 intra-cellular availability could not be rule out. In the case that the gene products interact with the bioactive molecule they may do so with the two part of Sortin2 since their loss of function mutants were resistant to 5537685 as well. In this scenario how Sortin2 affects both endocytic and secretory pathways is undetermined. Clc1 is a structural protein that allows generation of clathrin-coated vesicles (CCVs) from plasma membrane (PM) and TGN for endocytic and secretory pathways respectively . Also Sla1 has a function in endocytic CCVs formation as is present at clathrin-coated pits at plasma membrane . Interestingly it has been proposed a role of SLA1 in late endosome-to-vacuole trafficking likely related to clathrin function as well [44, 45]. Based on the close functional relationship between Clc1 and Sla1 it is plausible that Sortin2 is interacting with the entire structure at the clathrin pit enhancing vesicle trafficking. In addition Met18 genetically interacts with Sla1 suggesting a related function however still unknown . 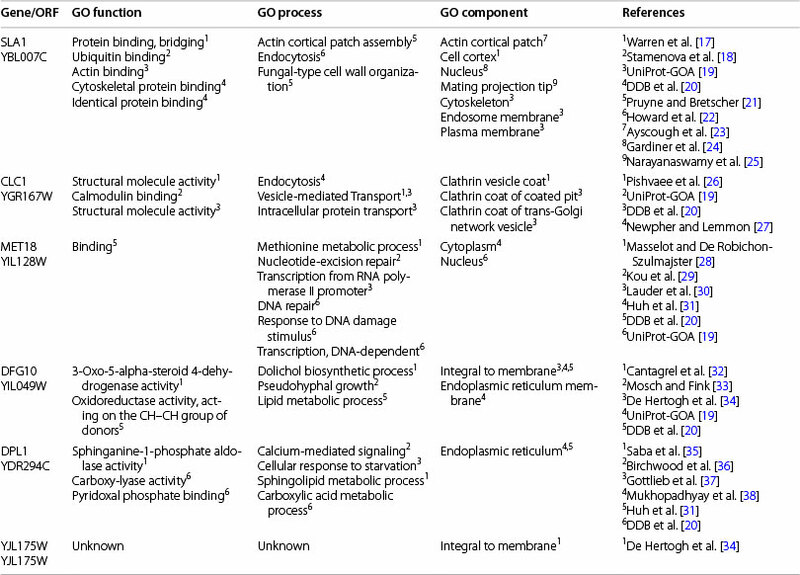 The physical and genetic interactome analysis revealed that one of the most enriched GO processes was "vesicular cellular import" (8.3-fold enrichment) in which all genes belong to the term "endocytosis''. This result supports our observations of FM4-64 internalization and confirms that most likely the still undetermined molecular targets of Sortin2 are related to the cellular trafficking pathways. Moreover, interactome GO component classification revealed that of all possible cellular components, only five locations had significant representation on the Sortin2-resistance dataset. Three of these are involved in or related to endomembrane system components; cytoskeleton, punctate composite and transport vesicles. The high representation of "DNA processing and transcription elongation GO function" is consistent with the presence of MET18 within genes whose deletion confers resistance to Sortin2. In addition, high representation of these cellular functions correlates with the GO component, showing that nuclear location is represented in the dataset. However how these types of GO molecular processes and MET18 function are related to protein trafficking still remains unclear. Interestingly, several proteins involved in the endocytic process have been also related to chromatin remodeling, transcription and cell division functions supporting that those processes are somehow related [48, 49]. These findings may provide an explanation for highly represented processes in our interactome analysis and support that Sortin2 is affecting mainly endocytosis and/or endocytic-related processes. Analyzing the structure-bioactivity relationship of Sor-tin2 provided insight into the molecular mechanism of its mode of action. The Sortin2 analog that lacks the sulfonate group on Sortin2 causes no effect in the endocytosis time frame. Replacing the sulfonate group with a group with a dense electron cloud such the benzoic ring or carboxyl group restituted Sortin2 effect on endocytosis. However, compound 6269701 did not affect the endocytosis, showing the importance of the chloride in the chlorobenzene ring. It is possible that rather than chloride itself being important, the lack of bioactivity is due to steric hindrance of the nitro group. Therefore, the effect of Sortin2 on endocytosis depends on these two parts of the molecule, the sulfonate group and the chlorobenzene ring. Interestingly, for both biological effects of Sortin2 on endomembrane trafficking, the same structural features of Sortin2 are required. For triggering the secretion of CPY, it was shown that both structural features of Sor-tin2, the sulfonate and the chlorobenzene ring are equally necessary . Consistently, chemical 6269701 was also inactive for CPY trafficking . Overall, the analysis of Sortin2 functional structure features strongly support a link between its effect on trafficking to the vacuole and the endocytic pathway. Critical S. cerevisiae proteins for the mode of action of Sortin2 have been identified by means of reverse chemical-genetics approach. Endocytosis is the principal biological process targeted by Sortin2 base on mutant phenotypes, GO annotation and the interactome of the six ORFs whose deletion caused Sortin2 resistance. In fact Sortin2 treatment enhanced trafficking of the endo-cytic tracer FM4-64 toward the vacuole supporting the consistence of the genetic data. Overall the link of the Sortin2 effect of on the secretory pathway and its effect on endocytosis is supported by the genetic, cellular and chemical data in S. cerevisiae. Sortin2 and its related structures were obtained from ChemBridge (San Diego, CA, USA); the latter are referred to here by the identification numbers assigned by the manufacturer. S. cerevisiae were grown in regular Yeast Peptone Dextrose (YPD) liquid or solid (1.5% agar). Single yeast colonies were picked from YPD-agar plates, inoculated in liquid YPD and grown for 48 h at 28°C with constant shaking to generate an initial culture for the assays. Chemical treatments were performed in medium supplemented with the designated compounds or 1% DMSO as a negative control. Cultures were grown with the chemical compound for 72 h at 28°C. To evaluate the effect of Sortin2 on yeast growth performance, Sortin2-resistant strain cultures at equal initial optical density (OD600 = 0.2) were grown in YPD supplemented with 20 μΜ Sortin2 or 1% DMSO at 28°C. Subsequently OD600 was measured at different times. For evaluating cell viability, a fraction of cells grown in these conditions for 72 h were diluted 1 to 100,000 and plated on YPD on triplicates. Colony-forming unit (CFU) were scored after 2 days. The assay was repeated twice. The primary screen was performed using the S. cerevisiae haploid deletion library that contains 4,800 yeast strains generated from the BY4742 parental strain (MATal-pha his3Δ1 leu2Δ0 lys2Δ0 ura3Δ0; Open Biosystems, Huntsville, AL, USA). The strains (OD600 = 0.2) were grown in darkness in YPD liquid medium supplemented with 47 μΜ Sortin2 and 1% DMSO, in a microplate format. After 72 h, growth medium was collected and analyzed for secreted CPY as described previously  using alkaline phosphatase labeled secondary antibody. All the deletion strains that did not secrete CPY due to Sor-tin2 in the primary screen were analyzed for CPY secretion at increasing concentrations of Sortin2 (5, 10, 20 and 40 μM). This assay was performed using peroxidase labeled secondary antibody to enhance its sensitivity and it was repeated three times. Mutants were considered as resistant to Sortin2 if CPY secretion was not detected at concentrations less than or equal to 10 μM because this was the concentration that trigger secretion of CPY in the wild type strain using peroxidase detection. Yeast cultures (OD600 = 0.2) were grown with 20 μM of chemical compound and 1% DMSO for 72 h at 28°C in darkness with constant shaking. Cell cultures were cen-trifuged at 5,000 rpm for 4 min and re-suspended in fresh growth medium. Cells were incubated with 24 μM FM4-64 (Invitrogen) at 4°C for 30 min. Subsequently, the FM4-64-containing medium was replaced with fresh YPD medium and cultures was incubated at 28°C. To observe FM4-64 distribution, 5 μl of the suspension were placed on a slide pretreated with 1 mg/ml Convanavalin A. Endocytosis of FM4-64 was examined at 0, 15, 25, 40 and 60 min at 28°C using Zeiss LSM 510 confocal microscope with a 543 nm emission filter. Approximately 25 cells were observed for each condition. The experiment was repeated three times; representative images are shown.